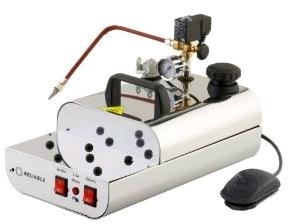 Reviews of dental steam cleaners and everything you need to know to purchase a dental steam cleaner for your practice. As a professional you know the value of switching from chemical based cleaning to natural environmentally safe methods. In the Dental industry there are many options when it comes to choosing a dental cleaner. This article will provide thorough reviews so that you may be able to choose one that is perfect for your practice and your budget. This is an excellent cleaner that was made in Italy and approved by the ETL. It quickly and easily cleans away plaster waste, wax and other debris. It emits are very high quality dry steam which can be used to clean and sanitize just about anything! With up to four hours of usage time, it only requires about 2/3 of a gallon of normal tap water. This cleaner is touted as the dental industry’s most trusted dental steam cleaner. It is easy to see why as noted by it superior components, cleaning ability and power. Like the i500B model it is great at cleaning left over wax, plaster, debris and polishing the finished product. However, this cleaner provides much more performance than its brother the i500B. Even though the Reliable i500B is less expensive, the i700B offers more features and more power. But if you are working on a tight budget, the i500B is the best buy. All Dental labs would agree that this is the most flexible cleaner. Quite similar to the i500B and i700B however, it does have added features. • Two 1,200 watt heating elements i.e. one is a spare. The same as the i700B. • 70 psi operating pressure which is the same as the i700B. 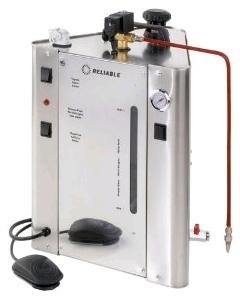 The Reliable series of dental steam cleaners are well known and trusted in this industry and as such it is best recommended that you consider one of these models which are well suited to all of your dental cleaning needs.